June 2016 – somewhat bookish. I read 6 books in May. 5 were fiction, one was non-fiction. 4 were in print, 2 were on the Kindle. 3 were by writers of color – so I met my 50% goal. Nimona by Noelle Stevenson (2015). Super fun graphic novel about a shapeshifter who apprentices herself to a villain (who is actually the good guy). Saving Montgomery Sole by Mariko Tamaki (2016). Picked up this YA novel by Mariko Tamaki (who has written some graphic novels that I enjoy) and was delighted to discover that Ms. Montgomery Sole had two moms. Best friends, cosmic mysteries, and homophobic ministers all play a part of this high school tale. Simon vs. the Homo Sapiens Agenda by Becky Albertalli (2014). Totally delightful, boy likes boy, nothing terrible happens YA novel. There should be more queer books with happy endings like this! Fake ID by Lamar Giles (2015). I’m probably not the target audience, but I enjoyed this YA novel about a teenaged boy whose family is in the witness protection program. Don’t know that I’ll read the next one in the series, but happy to have tried this one. Journey to Munich by Jacqueline Winspear (2016). The latest in the Maisie Dobbs series brings our heroine to Germany on a quest to save a valuable British citizen from a detention camp. Good, as always. The Chicken Chronicles: Sitting with the Angels Who Have Returned with My Memories: Glorious, Rufus, Gertrude Stein, Splendor, Hortensia, Agnes of God, The Gladyses, & Babe: A Memoir by Alice Walker (2011). My mom had been recommending this book to me for a while, and while I can see why it appeals to her (my parents retired to become farmers and raise 150ish chickens), I super hated it. I read Walker’s daughter’s memoir many years ago, and this book does nothing to dispel the impression that book gave of the elder Walker being kind of a crappy mother (she never mentions her daughter in this book, but does call herself Mommy when talking to/about her chickens). Not my cup of tea. Real Sisters Pretend is a sweet and simple tale about two sisters pretending to be mountain-hiking princesses. In the context of pretend play, big sister Tayja tells little sister Mia that they don’t have be pretend to be sisters, they are real sisters “because of adoption”. Published in 2016, I discovered this on my public library’s “New Books” display. Yay, libraries! Pros: I love that this is a book about adoption – and especially about transracial adoption. The author Megan Dowd Lambert is by her description: “a white, bi parent of six children in a multiracial, adoptive, blended family that includes two moms and two stepdads.” Yay for queer folks writing our OWN stories! Nicole Tadgell’s illustrations are lovely. I especially love the illustration of the two sisters looking at the picture of their family on Mia’s “adoption day”, the first time we realize Tayja and Mia have two moms. I’ve probably made clear, that books with two moms that aren’t ABOUT having two moms are my favorite, so this is right up my alley. Cons: I don’t really have any. It’s light on plot, but it’s just the sort of basic story, with a family that happens to have two moms that I am always hoping to stumble across. I would be interested in hearing what adoptive families think of this book – does the adoption discussion seem heavy handed? I thought it was great, because adoption is not something we had specifically discussed with our four year old, even though her aunt is adopted and she has a several friends with families created through adoption. I found it helpful to have it be so explicit. But I know that I often wish the Two Mom thing was less explicit, so I wonder if adoptive families sometimes feel the same. The Bottom Line: Love this book! Definitely pick it up from the library or buy yourself a copy. So happy to have stumbled across it! Looking for more books about queer families? You can find the other books I’ve reviewed here. I am so sad today. But not for the reason you would assume. Or not just for that reason. Today is the one year anniversary of the death of my host mother. My sorrow over the 50 people dead in Orlando, members of my beautiful queer community, mingles with my grief over the death of my incandescent host mother, Susanne, grief so intense that I can only look at sideways. Every time I have thought of her in the past year, I have cried. Sobbing in the shower for days after I found out she had died. Walking down the street, something will remind me of her, and suddenly my eyes are full of tears and I’m trying to pull myself back together. To call this grief feels melodramatic, like I am coopting someone else’s tragedy, but it is the only way I can describe this feeling. This desolate sadness that a 50 year old woman, a veterinarian, a Scrabble player, a lover of perfume and John Irving novels, a wife, a mother, an only daughter, a friend, a beautiful amazing wonderful human being is dead of cancer. She was the best and I cannot fathom that she is gone. I cannot make sense of it. There is no sense to cells, growing out of control. There is no sense to dead at 50. It feels tragic. And unfair. And scary as hell. Your mind, selfish as ever, calculates. I am closer to 50 now than I am to 16, the age I was when I lived with her in Germany. If I were to die at 50, Frances would be 16. Not even out of high school yet. Suse has amazing children, my host brother and sister, both in their 20s now. Early to mid. Not late. Not old enough to lose a mother. Are you ever old enough to lose a mother? She has a husband. Had. I can’t, even on my most morbid melancholy days, imagine the death of my wife. How do you go on? My mind rejects it. At least a mass shooting makes some sort of sick sense. People call it senseless, but it follows a pattern: Man (and it is almost always a man) gets mad, has access to guns, takes that anger out on people he hates or resents (women, gay people, classmates, coworkers). And here I go, back on the safer ground of national tragedy. How sad that a mass shooting is so common place to be “safer ground”. How privileged that I am so unfamiliar with this unrelenting personal grief. With national tragedies, you can take strength in community, your anger has a place to go: public policy changes to support, money to donate. I have felt so alone in this grief. Unwilling to dump in to the circle of her family: husband, son and daughter whose grief eclipses my own, but with no one really to dump out to who knew her. Not really. Is this how it always feels? That no one knew this person that you loved? Not really? How scared I am that this is a preview. That this is my life now. As years go by, those that I love will keep dying. I will keep grieving. It will only get harder to shove that grief in a corner and look at it sideways. The seal has been broken. There is no solving this. No way but through. She lived. She was loved. Not most by me, but most definitely not least either. She died. It makes no sense. D.C.’s Presidential Primary is tomorrow, so this seems the perfect time to share Two Friends: Susan B. Anthony and Frederick Douglass by Dean Robbins. The book tells of Anthony and Douglass’s fight for rights, including voting rights – and also their friendship and planning over tea and cake. Sean Qualls & Selina Aliko (who also collaborated on The Case for Loving) are responsible for the great mixed media illustrations. 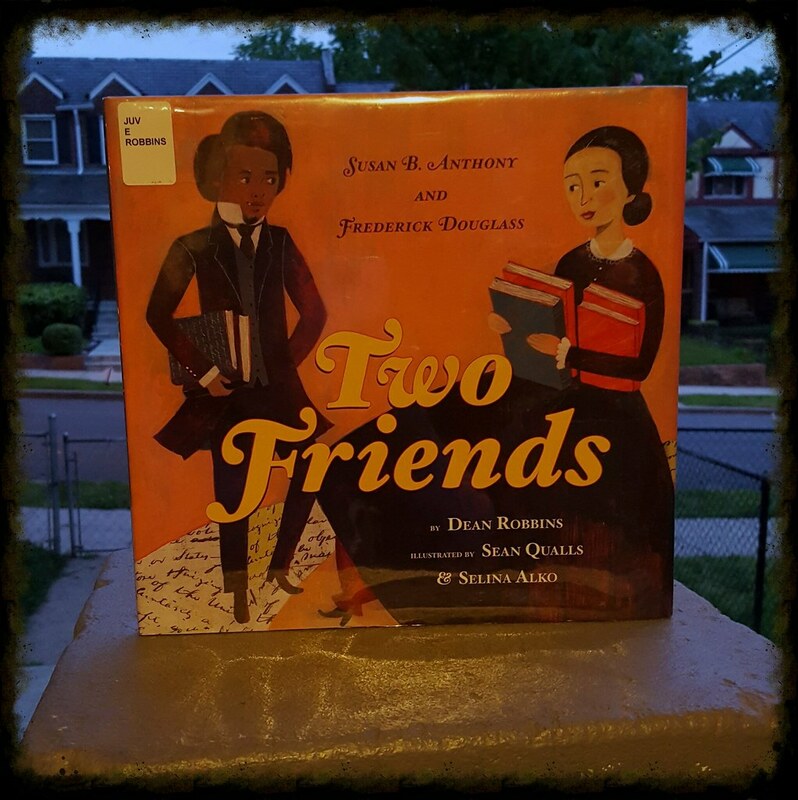 A preschool-appropriate introduction to two very important Americans!